When Americans line up for salad, you know there must be something special about it. That's exactly what's happening at the hot new restaurant chain Sweetgreen. It is already being dubbed the "next Chipotle." "Healthy food shouldn't just be for the top 1%," Jonathan Neman, one of the co-founders, told CNNMoney. The company has a lot of similarities to "fast casual" chains like Chipotle (CMG). Customers' meals are created in about a minute as they move down a line. The menu includes salads, soups, rice bowls and grain bowls (think: quinoa). The emphasis is on sustainable food. Produce is locally sourced as much as possible, and the menu changes seasonally. There's even an "early summer" and "late summer" menu. Most entrees are priced around $10. A sweet touch: Walking into a Sweetgreen restaurant feels distinctly different than most fast food chains. 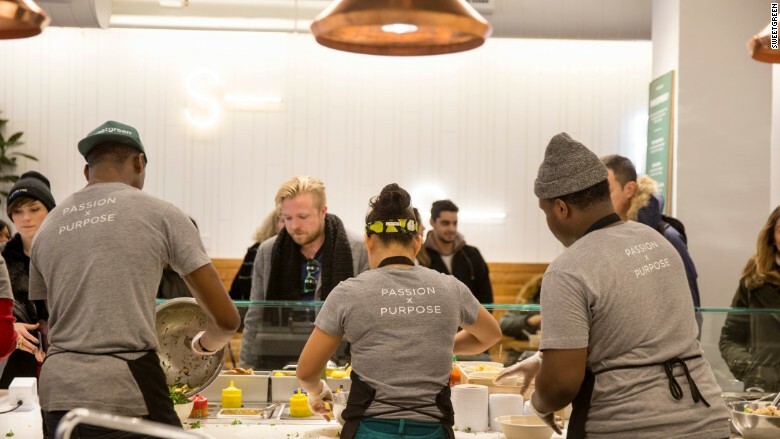 Employees are dressed in shirts that say "passion and purpose." Stores are clean and modern, and the decor is often recycled material. They take wood from old barns or bowling alleys, for example, and make it into tables. The first Sweetgreen restaurant opened in an old burger joint in Washington D.C.'s Georgetown neighborhood. "It's so much easier to find a burger than healthy food," says co-founder Neman. Staff are very friendly. The brand has a "sweet touch" philosophy where everyone on the serving team is encouraged to make somebody's day. "We don't just pass food down a line. We take your salad and move along with you. 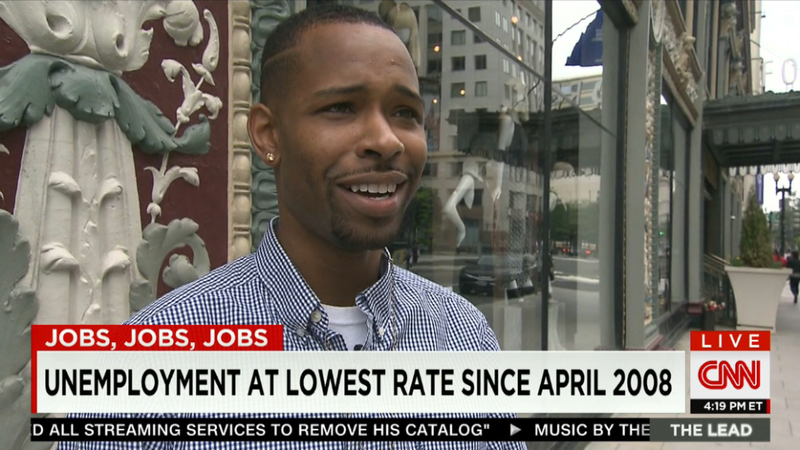 We're interacting with you and trying to make you a little happier," says Ryan Jackson, 26, who works at the Connecticut Avenue store in D.C.
Jackson applied to work at Sweetgreen after eating there several times and loving it, especially the Caesar salad. He feels the brand "stands for what I stand for," including doing outreach to inner city youth in D.C. to help kids sample healthy foods. Early success: Sweetgreen has 31 restaurants so far with locations in D.C., New York, Boston, Philadelphia and Los Angeles, but it already has a loyal following. They plan to open in San Francisco soon and are looking at other cities. Customers regularly post photos of their meals on Instagram and Twitter (TWTR). Sweetgreen already has over 61,000 Instagram. By comparison, Chipotle has more than 200,000 Instagram followers, but it also has over 1,700 locations. Sweetgreen is being called the "next Chipotle" because of its cult following and financial success. The chain just received $35 million more from private investors (a series F round) at the end of June. That brings the total outside investment in the company to over $90 million. Sweetgreen declined to disclose its sales or whether it is profitable yet, but its backers include T. Rowe Price and Steve Case, the co-founder of AOL. Case kept noticing lines outside a Sweetgreen restaurant on his drive home from work in D.C. He stopped to check it out and has been a regular ever since. He believes the company could be as big as Starbucks (SBUX) one day. "Sweetgreen has the opportunity to be a cultural phenomenon," says Case, who has invested personally in the chain as well as through his investment company Revolution. More than food: Sweetgreen does a lot more than salad. The company describes itself as a "culinary lifestyle brand." They host a music festival, teach thousands of elementary school students about healthy food, and give employees green Converse sneakers after a year of service. "It's a movement for a new way of living," says Neman. "You can have a world where healthy food is still delicious and still affordable. You can have a major music festival that is still good for you and good for the planet. You can have a business that makes money and gives back to the community." 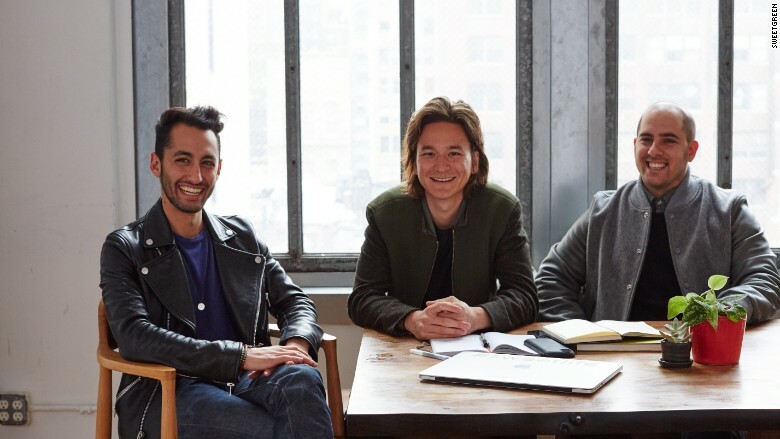 Sweetgreen founders Jonathan Neman, Nathaniel Ru and Nicholas Jammet. They met as students at Georgetown University. Growing pains: The biggest challenge for Sweetgreen now is growing across the country without losing its ethos and customer service. It already has 1,000 employees. Anu Jain, a law school student and lifestyle blogger who runs the site Tea for Two, was an early Sweetgreen fan when it opened in Boston. She raved about all the salad dressing varieties and often placed orders on her phone and then picked it up. But last month, she found bugs in one of her salads and tweeted about it. "I tasted something weird. I was shocked," Jain told CNNMoney. The company did offer to refund her and responded to her tweet by saying that when ingredients are truly fresh, something like that can happen, albeit rarely. What's next: For now, Sweetgreen is riding a momentum wave, as the lines at lunch time show. "The company and organization stands for something big," says Jackson, who was so excited when he got hired at Sweetgreen that he posted a video about it on Instagram. He is paid $10.15 an hour and receives a free meal every shift. He hopes the chain will make America more healthy -- and sustainable, too.